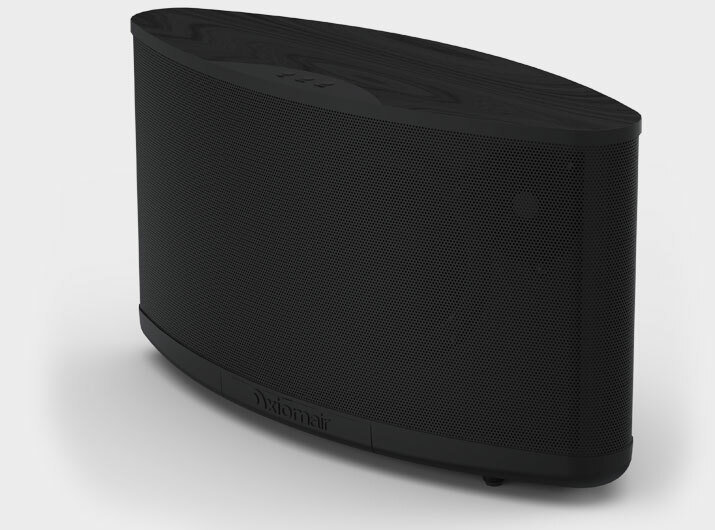 AxiomAir, a wireless speaker system designed to amplify life’s moments. The AxiomAir is a Bluetooth device so you can connect to it easily when away from your network. 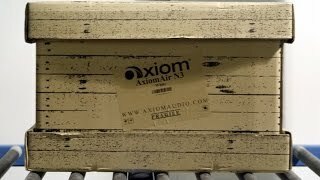 But the AxiomAir also broadcasts its own WiFi network when not in range of your home network giving you the option to still use WiFi to connect when away from home. Using the WiFi Hotspot will give you a greater range and the ability to have multiple users at the same time. Now, the beach has never sounded so good. AxiomAir also broadcasts its own User Interface (UI) that can be accessed by using our Apple or Android Apps or by double clicking on it from the Network page on your computer. From the AxiomAir UI you can play WebRadio stations, access your music library on a NAS, access songs from a USB drive plugged into your AxiomAir, and access TIDAL. From the UI you will be able to control the Analog and Optical inputs. If you have your TV plugged into the Optical input you will be able to select that input and control its volume from the UI. The AxiomAir UI is also where you can access all the AxiomAirs around your home, group them, rename them, and check for the latest software updates. Add the optional Karaoke module with our proprietary feedback-killing circuitry and two microphone inputs. AxiomAir becomes your Karaoke machine, with music volume, microphone volume, and echo level all controlled from the user interface. Give presentations that sound better than anyone else's. No really – the Karaoke module also works for presentations, so your AxiomAir becomes a portable sound system that will broadcast your voice with crystal clarity. 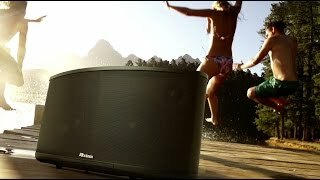 There are many places where you might want to enjoy music on your AxiomAir that are out of range of or lacking a useable WiFi network: at the dock, on the beach, on a camping trip, etc. To make sure that you can still enjoy your music, the AxiomAir has both Bluetooth available, which is great for streaming, and a built-in WiFi hotspot which automatically becomes active when out of range of your home network. This is signified by flashing blue and red LEDs. When the hotspot is available, your AxiomAir will appear as an available WiFi network on your device’s WiFi or network settings. To connect to the AxiomAir WiFi hotspot, simply join the AxiomAir-xxxxxx network. On iOS devices, a Safari window will automatically open to our WebUI. Tap “Cancel” in the top right corner and a pop-up will appear. Tap “Use Without Internet” and then close the web page. Once connected you will be able to play music that is resident on your device or on a USB drive plugged into your AxiomAir. For more questions and answers, please visit our page dedicated to AxiomAir instructions and frequently asked questions here. WiFi Hotspot for easy connectivity. This is the best sounding battery-powered speaker I've ever heard. The commitment to Free Software (aka Open Source) and GNU+Linux based operating system is icing on the cake. I just got an email that a major update has just been released for it, two and a half years after it released. That's more than most flagship phone manufacturers can claim! Apparently, this update brings Bluetooth support, which requires a USB dongle, but that addresses my biggest complaint right off the bat. Thus far, I have been using a Bluetooth to 3.5mm aux adapter, which creates a mess of wires and also has a constant fuzzy static when the adapter turns off (so I either have to unplug it from the speaker entirely or turn off the speaker). It will definitely be nice to clear the mess of wires with a proper USB attachment, and I hope for Bluetooth 5.0 support with low power and high audio quality! Looking forward to see something in the accessories section for that. The other issue has been with the power cord and connector on the back. The plug is weak and protrudes so if you ever need to tilt the speaker backwards (which you may have to since all the controls are hidden under the front corner), the power cord will get damaged very easily. Mine finally broke off completely so I need to get another if I want to use the speaker again. Lastly, the battery capacity has been degrading over time, which severely limits it's portability.